Despite the efforts of former presidents Vicente Fox and Felipe Caldéron the drug cartel war and related violence in Mexico still continues today. More than 1.6 million Mexicans left their homes because of drug violence from 2006 to 2011, according to a May 2011 survey of the Mexico City polling firm Parametría. They might consider themselves lucky, because they are not among the 70,000 Mexicans slain in the drug war, or not between the 25,000 enforced disappeared according to a leaked list of the Ministry of Interior. Civilians seem to be fed up with threats, kidnappings, robberies, extortion and the failing anti-violence policies for a long time. The new arising (unlawful) Mexican self-defense vigilantes are the latest result of this desperate situation. There is growing concern about various paramilitary groups that are operating in Mexico. I will try to zoom in on those concerns here and will discuss the various paramilitary groups that are present in Mexico. History is teaching us that paramilitary groups - legal or illegal, state- or private-controlled - usually intensify the conflict situation that was meant initially to be pacified. The result is usually more violence, more human and civil right abuses, more impunity and the paramilitary groups can easily grow cancerous. There are similarities between the situation of the paramilitaries in Mexico and Colombia. In both countries the violence is fueled by huge drug profits. Unfortunately the profits that are presently made by the Mexican Drug cartels have become much bigger presently than those in Colombia. The Mexican drug cartels are also extending their reach to Central-America and even Colombia, which means even bigger profits. In the US they control as much as 70 per cent of the drug trafficking. Bigger profits usually means more arms and more violence to protect the "business". If you look at Stratfor's 2012 map below on cocaine profits, you'll notice that most profits are made by Mexican Cartels, which control the trafficking routes from Honduras into the USA. Along the supply chain there is also quite a bit of "cutting," which is when substances are added to the cocaine to dilute its purity and stretch profit. According to the Colombian National Police, the purity of cocaine leaving the country is about 85 percent. By the time it reaches the USA it drops further to about 60 percent at the retail level, according to the U.N. World Drug Report 2012. The Cocaine Value Chain from Colombia to the U.S. The on going drug cartel war in Mexico is about trafficking routes, border control, major cities and disputed territories where marijuana and opium is grown. The cartels are also in methamphetamine production plants located in Mexico and providing 80% of the US market today. Methamphetamine is dissolved in water and placed in all kinds of different containers to avoid detection at points of entry in the US. 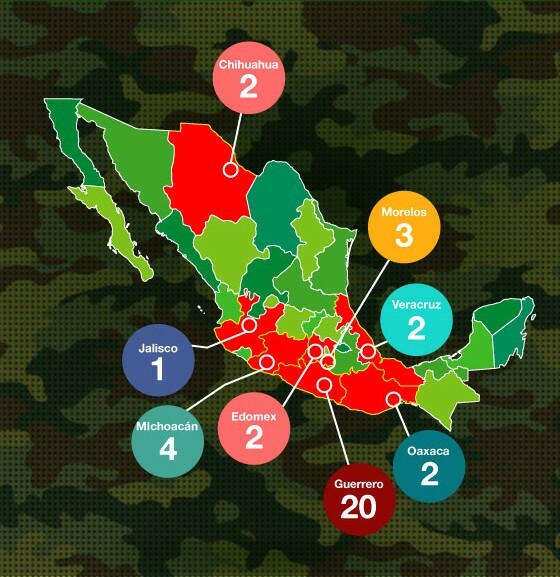 As many as 36 new militias ("Policías Comunitarias") have arisen in Mexico since 2012. According to Excelsior the number is even 45. These militias are unlawful and consist of unscreened, untrained and inexperienced civilians. They're not uniformly armed and recognizable and they don't fit in Mexico's police and judicial system. If not regulated and controlled, one has to fear that these vigilante groups could become easy targets for the drug cartels or end up starting to work with drug trafficking organizations, either for payment or under threats. This could be voluntary, as it would likely be lucrative, or it could be coerced to some degree. Meanwhile, in Congress, the Partido de la Revolución Democrática (PRD) filed with the Senate, a constitutional reform initiative that seeks legal recognition of community policing. The Southern state of Guerrero is one of the Mexican territories that is heavily disputed by a number of powerful drug gangs. Civilians in and around the town of Ayutla, State of Guerrero have also taken the law into their own hands. They have risen up in armed revolt against local drug traffickers that have terrorized the region and a government that residents say is incapable of protecting them from organized crime. Rural Police, politicians and militaries are often bribed and/or threatened by the cartels. That's the main reason that the drug violence can continue. Suspected and "arrested" criminals in Ayutla have to stand before the public of the village, guarded by members of the civilian posse. Here, the vigilante posse is parading captured criminals through a public square, broadcasting their crimes to an assembled crowd (and National press). Bruno Placido said his vigilante organization Unión de Pueblos y Organizaciones del Estado de Guerrero (UPOEG) is seeking to form a national movement with other "self-defense" groups that have sprung up throughout Mexico to fight crime fueled by drug cartels. Presently UPOEG consists of 700 paramilitary members. The latest (March 2013) development in Guerrero is, that there is an initiative to transform UPOEG groups to (legal) CRAC (Coordinadora Regional de Autoridades Comunitarias) groups. The Coordinadora Regional de Autoridades Comunitarias (CRAC) is part of the Sistema de Seguridad y Justicia Comunitaria (SSJC). It exists since 1995 and only in the rural, indigenous Montaña and Costa Chica regions of the state of Guerrero. Presently 77 villages in Guerrero state have organized legally-recognized CRAC "community police" in which poorly armed villagers detain and prosecute people. With their own jails, "courts" and punishments that can include forced labor for the town or re-education talks, these community police are usually recognized by state law. Presently, CRAC consists of almost 900 community police officers and is protecting a population of about 300,000 inhabitants. One of the main factors for the emergence of this new Community Security & Justice System (SSJC) was the inefficiency and corruption of the public security system of the State. The great wave of violence that appeared in Montaña and Costa Chica regions of Guerrero in the eighties and early nineties moved the inhabitants of some communities in the region to organize themselves and do something about it. The Sistema de Seguridad y Justicia Comunitaria (SSJC) has been remarkably effective. According to state officials the crime rate has decreased 95%. Several studies show that the SSJC model is sustainable and effective. However it is questionable if a CRAC militia would be effective without being embedded in an SSJC model. The Mexican drug cartels usually operate with their own well-trained and well-equipped paramilitary enforcement groups. For instance the origins of Los Zetas date back to 1999 as a paramilitary group, when commandos of the Grupo Aeromovil de Fuerzas Especiales (GAFE) of the elite Mexican counterinsurgency forces deserted their ranks and decided to work as the armed wing of the Gulf Cartel, a powerful drug trafficking organization. Los Zetas were used by the Gulf cartel to collect debts, secure new drug trafficking routes at the expense of other cartels, discourage defections from other parts of the cartel organization, and track down particularly ‘worrisome’ rival cartel and gang leaders across Mexico and Central America. They very rapidly became one of the most technologically advanced, sophisticated, and violent of the paramilitary enforcement groups. In February 2010, Los Zetas broke away from their former employer and formed their own criminal organization. Los Zetas continued to structure themselves like a military force, by dividing themselves into operational divisions in a number of Mexican states, cities, and towns. Besides drug trafficking, Los Zetas operate through protection rackets, assassinations, extortion, kidnappings, money laundering, arms dealing and are all together involved in more than 20 different criminal activities. Their brutal tactics, which include beheadings, torture and indiscriminate slaughter, show that they often prefer brutality over bribery. Paramilitary Death Squads are operating in Mexico to carry out extrajudicial killings. They could be comprised of police-officers (and/or militaries) that are acting on their own or taking paid orders from criminals to liquidate other criminal competitors like this story in Lagos de Moreno, Jalisco State. There are even police officers who have killed the mayors they were supposed to protect and it is common knowledge that in some cities the municipal police are working for the drug cartels. The number of enforced disappearances during the Calderón administration is app. 25,000. According to US state dept. cable, published by Wikileaks "There have been indications that local businesses [in Ciudad Juárez] are taking a different approach to self-protection; that of vigilantism. In October , the press carried stories of business people forming paramilitary groups to protect themselves from extortionists and kidnappers." One group that called themselves Comando Ciudadano por Juárez (Juárez Citizen Command, or CCJ) was apparently comprised of former Zetas-members. CCJ purchased previously seized weapons from the army garrison and also made themselves available to the army for extrajudicial operations. Edgardo Buscaglia, a wellknown expert in the field, claimed in an Proceso interview of 2011 that in Mexico 167 paramilitary groups operate that are funded by entrepreneurs determined to protect "life and property", guarantees that the Mexican state can not give you. In other cases governors paid for these armed groups to clean territories and save drug markets. The NYT, El Universal and NarcoNews report that Mexican military assassin teams that are in the field since 2011, are combating against the leadership of an emerging cadre of independent drug organizations that are far more ruthless than the old-guard Mexican “cartels” that gave birth to them. These Hit teams are supported by a sophisticated US intelligence network composed of CIA and civilian US military operatives as well as covert special-forces soldiers under Pentagon command — which are helping to identify targets. Mexican president Enrique Peña Nieto is starting his six-year presidential term with plans for a new paramilitary police force called the Gendarmería Nacional. This paramilitary force employed on police duties will initially consist of 10,000 officers and be operational at the end of 2013. Originally proposed during his presidential campaign with a target of 40,000 officers, the current plan was announced during a session of the Consejo Nacional de Seguridad (National Security Council) and the force is slated to police the contested plazas and regions impacted by insecurity. It is still unclear how the organizational overlap between Gendarmería and Federal Police will be handled, nor the overlap between the Army and Gendarmería. It is also unclear if all current civil rights will be respected. Obviously the Gendarmería Nacional will have more powers than the Federal or State Police and be better equipped. Details are unknown yet. and between organized-crime groups. That's exactly what happened during Calderón's presidency. President Peña Nieto declared that his security strategy will abandon the Calderón administration’s heavy dependence on military deployments and its focus on dismantling organized-crime groups. Instead, Mr. Peña Nieto pledged to place greater emphasis on crime prevention and violence reduction, making it clear that he no longer wishes to prioritize bringing down drug cartel leaders as his predecessor did. 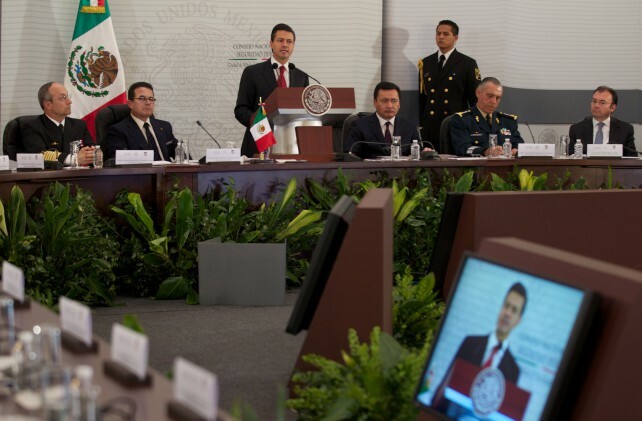 Peña Nieto also reconfigured Mexico’s security agencies, dismantling the Public Security Ministry (Secretaría de Seguridad Pública, SSP), announcing the creation of a 10,000-person National Gendarmerie and a unified police command system at the state level. The goal of the military, unlike law enforcement, is to neutralize the enemy on the battlefield — not bring that enemy to justice through the court system. It is usually inevitable that human and civil rights are abused when the military is deployed for Police tasks and/or law enforcement. This was also the case during the Calderón administration as this report tells us. The US and Mexican government’s strategy of attacking the so-called "kingpins" of the narco-trafficking industry has failed to stem the tide of drugs flowing into the US nor has it reduced the number of players in the narco-trafficking business. Instead, it has given rise to a slate of splinter narco-trafficking groups that have stepped into the power vacuums created when US or Mexican law enforcers and military have an occasional success and take out a top narco leader. These so-called splinter groups tend to be extremely violent in their approach since they are competing more intensely against more organizations for a slice of turf in the drug-trafficking, arms-smuggling, contract-murder, kidnapping and extortion business, acting as criminal organizations in their own right. A splinter group's profit from drugs is in the beginning relatively small while their expenses are high, so they have to make their profits from other - more violent - criminal activities. This “Hydra effect” (whereby the elimination of one “narco-kingpin” gives rise to three or four more aspiring splinter-group kingpins) has become a big problem for both the US and Mexican governments. Unfortunately it is not to be expected that the violence in Mexico will decrease as long as demand for drugs in the US is high, borders are open and US guns flow easily into Mexico.